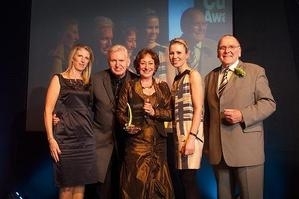 Rainford Tennis Club have won the title of Sports Club of the Year at the St Helens Cultural Awards. The Club received the award in recognition of all their success over the past twelve months, which has seen them achieve Tennis Clubmark, double the club membership and significantly increase the number of juniors attending coaching and competitions. Rainford have also been extremely active in local primary and secondary schools as part of the St Helens Schools Tennis Programme, which has been funded by the Big Lottery, Schools Sports Coaching programme and the Tennis Foundation. Helen Bligh, Chairperson of Rainford Tennis Club, received the award on behalf of the club at the ceremony held at the Park Inn Hotel in St Helens. Being named St Helens Sports Club of the Year comes just months after Rainford won the 2009 Club of the Year at the Lancashire Tennis Awards.